By Rachel Held Evans, on September 26, 2014. You can always pick out John the Baptist from a lineup of saints. Among the dour, robed patriarchs, he’s the one with wild eyes and tangled hair, ribs protruding through sun-browned skin, hands cradling a staff or a scroll that reads, "‘Repent! The Kingdom of Heaven is at Hand!” Or sometimes he is depicted munching serenely on locusts and honey, wearing a shaggy vest of camel’s hair. Sometimes it’s just his disembodied head on a platter. I’m not sure I’d have believed the guy either. The miracle child of Elizabeth and Zechariah, John was probably expected to follow in the footsteps of his father and become a Temple priest. There, he might have assisted faithful Jews as they washed in ceremonial baths to cleanse themselves of impurities. But John didn’t stay at the Temple among the baths. John went out to the rivers. In other words: God’s on the move. Get out of the way. For no mountain or hill—no ideology or ritual or requirement or law—can obstruct Him any longer. Temples cannot contain a God who flattens mountains, ceremonial baths a God who flows through rivers. Repentance means leaving the old ways of obstruction behind and joining in the great paving-of-the-path, the making-of-the-way, the demolishing of every man-made impediment between God and God’s people so the whole earth can celebrate God’ uninhibited presence within it and welcome the arrival of the Messiah. Not everyone liked this sermon. 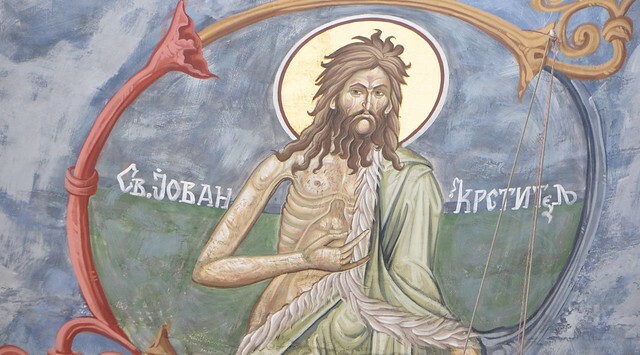 Needless to say, John the Baptist was what you might call a polarizing figure, popular among those who had traditionally been excluded from the faith community and not so popular among those whose reputations and careers depended upon protective walls. So when the religious leaders question Jesus’ authority, Jesus made a political statement by reminding them that it was John who had first recognized his authority. Jesus was building a coalition—of tax collectors and prostitutes, of women and Samaritans, of wilderness preachers and leprosy patients, of the poor, the sick, the hungry, and the left-out—and nearly everyone could see that it was prophetic; it "wasn’t of human origin." ….Except for those whose power depended on maintaining the status quo. …Except for those who expected God to color within the lines. This Jesus movement just didn’t sit right with them. It’s easy to judge those guys in hindsight. I’d love to believe that, had I lived in first century Palestine, I’d have dropped my fishing nets or water jars and followed Jesus the moment he reached out his hand to me. But on those days when I fold my arms and turn up my nose and declare with total confidence that “this cannot be God here,” and “this cannot be God there”…well, I’m not so sure. We tend to look for God where we expect to find Him, even while God is tapping us on the shoulder and shouting, “Hey! I’m right here! Pay attention!” I don’t like the idea of God using people and methods I don’t approve of and yet that seems to be God’s favorite way of working in the world—outside my expectations, right where I’m prejudiced, against all my rules. You would think that after all this time I’d have given up on expecting this river-wild God to fit safely in my categories. You know how Jesus said to Thomas, “blessed are those who haven’t seen and still believe”? There are days when I wonder if it’s actually easier to believe from this distance, without seeing, than it would have been to believe up-close, among all those questionable people and amidst all those radical teachings. We’ve sanitized the gospel so well in this culture, we’ve made it more accessible to the powerful than the powerless, more appealing to the cautious than to the troublemakers. I am too cautious. I have seen God work beyond my expectations and, like the religious leaders, refused to change my mind. God, forgive me. Open my eyes. Tear down the mountains I’ve built of my theology and flatten the walls I’ve constructed of my prejudices. Make a straight path right through my stubborn, hardened heart.